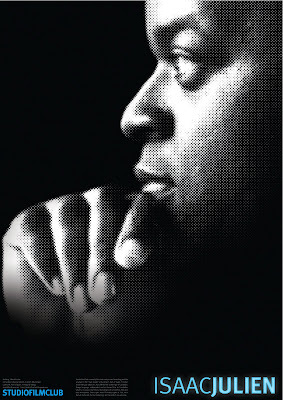 StudioFilmClub is proud to present two evenings of screenings of the films of Isaac Julien, as part of the Trinidad and Tobago Film Festival. Julien is an acclaimed British director, and is of St Lucian parentage. He will be at StudioFilmClub for the screenings, which take place on Thursday 18 and Thursday 25 September, at 8.15pm. On Thursday 18, Julien's new feature-length biopic of the late artist and independent filmmaker Derek Jarman, entitled Derek, will be shown. The film is to be preceded by the screening of a number of Jarman music promos for such acts as the Pet Shop Boys and the Smiths. Then on Thursday 25, a selection of Julien's shorter films will be shown: Paradise Omeros, True North, Fantôme Afrique, Western Union: Small Boats, and Baltimore. Both nights of screenings are free, and as always at SFC, all are welcome. The T&T Film Festival, now in its third year, runs from September 17 to 30. This is the second year that StudioFilmClub has partnered with the Festival; last year, SFC hosted a programme of film screenings entitled Babylondon, comprised of films set in London made largely by Caribbean British filmmakers.